What Is DD Form 294? DD Form 294, Application for a Review by the PDBR of the Rating Awarded Accompanying a Medical Separation from the Armed Forces of the United States is a form used to apply for a disability rating review if the applicant is separated but not retired for being medically unfit. 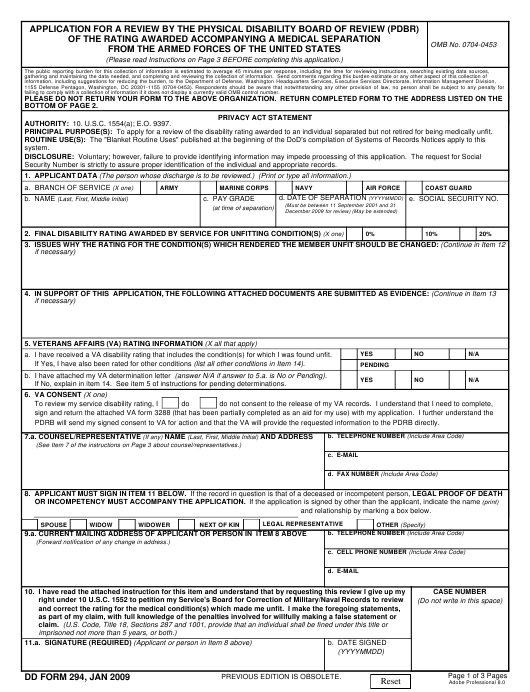 An updated DD Form 294 fillable version is available for download below or can be found through the Executive Services Directorate website. The latest release of the form - sometimes incorrectly referred to as the DA Form 294 - was introduced by the Department of Defense (DoD) in January 2009 with all previous editions being obsolete. The DD 294 is unclassified and officially approved for public release. The disclosure of the data pertaining to filing the application is voluntary. However, failure to provide the requested information or providing incomplete information may hinder the processing of the application. How To Fill Out Dd Form 294? failing to comply with a collection of information if it does not display a currently valid OMB control number. AUTHORITY: 10. U.S.C. 1554(a); E.O. 9397. PRINCIPAL PURPOSE(S): To apply for a review of the disability rating awarded to an individual separated but not retired for being medically unfit. Security Number is strictly to assure proper identification of the individual and appropriate records. a. I have received a VA disability rating that includes the condition(s) for which I was found unfit. If Yes, I have also been rated for other conditions (list all other conditions in Item 14). b. I have attached my VA determination letter (answer N/A if answer to 5.a. is No or Pending). If No, explain in item 14. See item 5 of instructions for pending determinations. PDRB will send my signed consent to VA for action and that the VA will provide the requested information to the PDRB directly. and relationship by marking a box below. Please print or type all information. Items are self-explanatory unless otherwise noted below. current name after adding the abbreviation "AKA". If the former member is deceased or incompetent, see Item 8.
still be reviewed for accuracy and fairness. by a Service Record Assembly Unit, you need not provide your Service medical records or the record of your disability separation. for more details.) Delay submitting this application if you want the PDBR to consider a pending VA rating; it will not reconsider a case. disability rating, but will not conduct the comparison discussed in Item 5 above. application is pending, you should notify the PDBR immediately. Correction of Military/Naval Records to subsequently review the rating for the medical condition(s) which rendered you unfit. 3 civilians in grade of GS-15 and above. 3 military officers in grade of 05/06 (or civilian equivalents. of error/injustice (may be waived in the interest of justice). September 2009 (may be extended). to comment before panel review and vote. injustice. There is a presumption of regularity. Will correct errors in records and/or remove an injustice. Rating reviewed for fairness and accuracy. Within discretion of the Board. Item 11.a. and b. A signature and date, entered by the applicant or people identified in Item 8, are required. The form is made up of three pages with filing guidelines provided on the third page. DD Form 294 instructions are as follows. Item 11 contains the applicant's signature and the date of filing and Item 15 is for any additional remarks applicable to their case.